Following Whispers: Walking on the Rooftop of the World in Nepal’s Himalayas Nepal: Birth place of Lord Buddha and country of Mt. Everest; Nepal is one of the naturally blessed places on the earth with the most diverse ecosystem. The home of eight of the world’s ten tallest mountains, along with top of the world Mt. 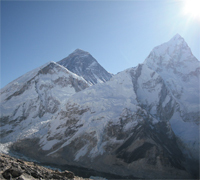 Everest; Nepal is among must-visit tourist destinations in the world. Nepal is resident of more than 2040 tallest peaks (6,000 meters above the sea level) and hundreds of rivers, lakes as well as fountains.As a land linked country Nepal borders to the south, east, and west by 4 Indian states Uttarakhand, Uttar Pradesh (UP), Bihar, West Bengal and Sikkim and the Tibet Autonomous Region, People’s Republic of China to the north. In terms of administrative division Nepal is divided into five development regions, 14 zones and 75 administrative districts. But nature has divided Nepal in 3 parts in its own way; the mountain region, the hill and the southern plains. Nepal is stretched in 147,181 square kilo-meters area with tourist destinations ranging from highest places (8,848 m) to the deepest low lands (61 m), panoramic tallest mountains to deepest gorges, sample monasteries to the biggest Buddhist Stupas and Hindu temples at the same place. In a sentence; every other destination in Nepal leads you to most beautiful places in the world surrounded by the astonishing ‘never-miss’ mountain panorama. 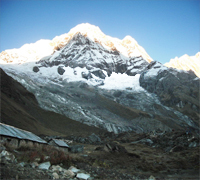 The Annapurna Region is the most popular trekking and mountaineering destination in Nepal. It is loved by mountaineers and trekkers as it comprises the world’s best trekking routes and astonishing Himalayan panorama. The highest numbers of the tourists visit this region every year. 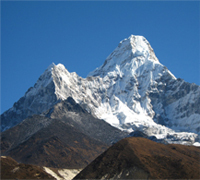 It receives more tourists than even the Everest Region. The Annapurna region is a rare combination of amazingly contrasting locations (driest to wettest, tallest and deepest). Annapurna itself is 10th tallest peak (8,091 m) in the world where as the deepest gorge in the world also fall in the same region. Everest Region that is also known as Khumbu region is situated in northeastern part of Nepal, Solukhumbu District, Sagarmatha Zone. This region is last resort to all of the mountain climbers, trekkers and nature lovers.Everest region including Sagarmatha National Park is home of the highest peak of the world Mt Everest 8,848 m (29,028 ft). 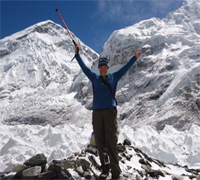 A heaven for mountaineers and trekkers; the region comprises 3 other peaks (top-ten) along with Mt Everest; Mt Lhotse 8,501 m (29,028 ft), Mt Cho Oyu 8,201 m (26,906 ft), Mt Makalu 8,463 m (27765 ft). The Everest base camp that is known as Kala Patthar. 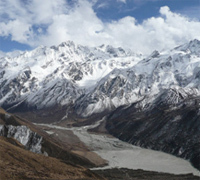 Langtang Region is the third most popular mountainous region in Nepal. It is popular not only as an ancient trade route between Nepal and Tibet but also as nearest and most accessible to and from Kathmandu Valley. Langtang lies just about 130 km north of the Kathmandu Valley equally closer to the Tibetan border. This region is a rare combination of nature, culture and adventure at once. 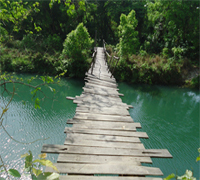 Langang had been declared national park in 1973 becoming first national park in the country. Langtang region is home to Nepal’s first national park, Ganesh Himal and Langtang Himal. Though there are no restricted areas in Nepal for trekking any longer; previously restricted areas are known as special trekking areas. The previously restricted areas were considered sensitive in terms of environment, culture and political points of views. The special trekking areas fall basically among less visited mountainous region; thus remain attraction to many of the trekking enthusiasts. Most of the special trekking routes in Nepal fall in the border of highly sensitive geography of Tibet, China, and conservation areas. For such restricted areas separated charges and special permits are required from Immigration Department. Nepal known as ‘Himalayan Republic’ is last resort for all the mountaineers around the world. The home of the highest peak in the world, Mt Everest and every other peak within top ten; obviously Nepal offers one of the best experiences of peak climbing in world. Nepal possesses more than a thousand highest peaks in the world ranging from 5500 meters (18,090 ft) to 8848m (29,028ft) above sea level.Nepal Mountaineering Association (NMA) has been allowing mountaineering lovers an opportunity to have firsthand experience of Nepali mountain peaks. Rafting is next popular adventure. 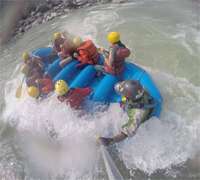 Rafting in Trishuli and Bhotekoshi rivers most popular. Kaligandaki, Marshyangdi and Sunkoshi are also rafting destinations. In the dry seasons (from October-mid December-March to early May) tourists can go for rafting if they are in group and for single there is alternative of kayaking and canoeing. It has challenged the minds and bodies. Raftingis an opportunity to all the adventure seekers who are physically fit. At the foot of the Himalayan Mountains, Nepal is blessed with an amazing diversity of rivers. Unlike certain other organizers, we only dispatch guides who are have summit experience on your target rafting. Along with Himalayan feel Nepal offers opportunity of beautiful experiences of wildlife observation. The forests in Terai region of Nepal are the resident of some of the rarest wildlife habitats in South Asia. A very popular form of tourism; Jungle Safari are practiced at various conservation areas in Nepal; where the tourist can have typical wildlife experiences. In Terai region Chitwan National Park, Bardiya National Park, Parsa Wildlife Reseve and Shuklaphanta Wildlife Reserve are most popular for Jungle Safari among tourists.You will see different Rare and Endangered Wild Animals, Trees (Flowers) and Birds of world in Nepal. 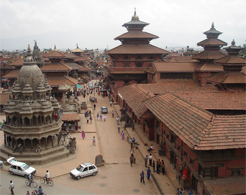 Day Tour Around Kathmandu Valley.